Machiavelli lays out what the prince of a territory should and should not do in order to rule successfully. His insight covers topics from how to rule your people, what to do with colonies, whether one should wish to be feared or loved (not hated turns out to be the answer), how to rule newly conquered people, etc. It is often very direct and harsh in its suggestions. A prince who is not wise himself will never take good advice, unless by chance he has yielded his affairs entirely to one person who happens to be a very prudent man. It is of the greatest important in this world that a man should know himself, and the measure of his own strength and means; and he who knows that he has not a genius for fighting must learn how to govern by the arts of peace. The term Machiavellian has been a bit distorted over the centuries to become synonymous with manipulation. While Machiavelli undoubtedly advises this in certain situation, that is not his main argument. Many valid points on how to deal with people or groups of people and while his examples are dated, his messages are as clear as ever. This entry was posted in Books and tagged Niccolo Machiavelli, Philosophy, Social, Strategy on March 11, 2015 by Blas. 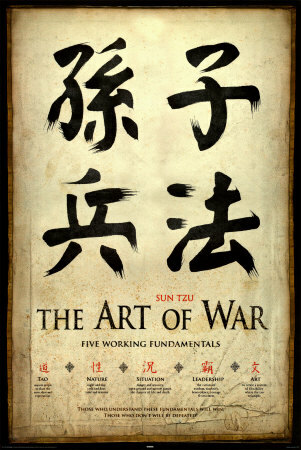 Sun Tzu’s 2,000 year old principles are as relevant today as they were back then. Whether in business, sports, war, or any other field, taking care of the small decisions as well as deception, disguise and diversion are all required for success. This entry was posted in Books and tagged China, Classic, Strategy, Sun Tzu, War on March 10, 2015 by Blas.